With federal research funds declining, agencies are streamlining and tightening up their review procedures. Getting the proposal right the first time has never been more important. What does this mean for you? We have answers for you in the next issue of the research newsletter. It will arrive in the mailboxes of faculty and grad students soon, but it’s available today right here through the PDF below. Other items of interest: an overview of A&T’s research compliance committees on human subjects, animal care and use, biosafety and radiation safety; news of a new requirement from NSF on data sharing; and July and August funding awards. Health-related grant-seekers, take note: The Moses Cone-Wesley Long Community Health Foundation has a new mission and (thankfully) a shorter name. The organization is now known as the Cone Health Foundation. It has narrowed its focus to four areas: access to healthcare, HIV/AIDS and other sexually transmitted infections, adolescent pregnancy prevention, and substance abuse/mental health. It also will become more active as an advocate for public policy to promote health. Researchers who have created innovations with commercial potential — and those who will in the future — have an opportunity next week to learn all about funding and other assistance available to help them commercialize their work and get it into the marketplace. The Office of Technology Transfer will hold a workshop titled, “SBIR/STTR: Funding your Innovation,” on the federal SBIR/STTR program on Thursday, October 7, 2 p.m. to 4 p.m., in the Fort IRC, Room 410. Speakers will include two SBIR/STTR specialists from the Small Business and Technology Development Center. Registration is online at www.sbtdc.org/events/sbir/workshops2010/index.html#register. Details are in the PDF below. The Small Business Innovation Research (SBIR) Program and the Small Business Technology Transfer (STTR) Program are competitive programs created to ensure that small, high-tech, innovative businesses are a significant part of federal research and development efforts. Eleven federal departments participate in the SBIR program; five departments participate in the STTR program awarding $2.5 billion to small high-tech businesses. The programs are run by the Small Business Administration. The NSF administers the SBIR.GOV site on behalf of the federal government. 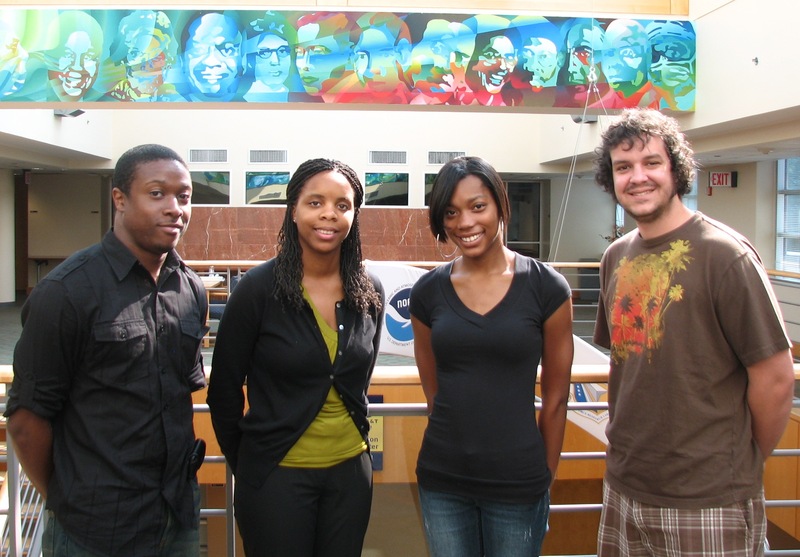 Undergraduate researchers, from left, Adrian Ambrose, Shauna Adams, Jasmine Brooks and Matthew Stanco. Research on antimicrobial agents, arthritis, thermal conductivity, and ultrasonic vibration has won recognition for four undergraduates. The students were honored for their presentations at the university’s first Undergraduate Research Symposium, held on September 22. Shauna Adams received the Best Presentation Award for “Longitudinal Heat Transport as a Method for the Determination of Thermal Conductivity.” Adams is a senior from Hampton, Virginia, majoring in mechanical engineering. Her advisor is Dr. John Kizito. Matthew Stanco was named runner-up for “Measurement of Ultrasonic Vibration Using Ultra-High Frequency CCD Laser.” Stanco is a senior from High Point, majoring in industrial engineering. His advisor is Dr. Zhichao Li. Adrian Ambrose received the Best Poster Award for “The Effects of Age on the Progression of Osteoarthritis and the Gene Expression in Mice.” Ambrose is a junior biology major from Roanoke, Virginia. His advisor is Dr. Greg Goins. Jasmine Brooks was the poster category runner-up for “Evaluation of Select Plant Essential Oils as Potential Antimicrobials.” Brooks is a senior from Knightdale, majoring in food science. Her advisor is Dr. Ipek Goktepe. Please join us at the Making Energy Work conference on Thursday, September 30th at the Benton Convention Center in downtown Winston-Salem. The conference will feature regional and national energy experts from GE, US Dept. of Energy, Apex Wind Energy, NC’s Energy Policy Council, NC Dept. of Commerce, NC Solar Center/DSIRE, USGBC, SJF Ventures, UNC’s School of Government, and many more. Great learning and networking opportunities for you and other attendees! Learn more and Register to attend at: http://www.energync.org. Online registration ends on Mon., Sept. 27th at noon. (If space allows, walk-up registrations will be taken at the event; please check NCSEA’s website for availability.) the event is hosted by one of the state’s major energy organizations, the North Carolina Sustainable Energy Association. Two significant events are coming up for Aggie researchers on Wednesday and Friday. On Wednesday, the Office of Undergraduate Research will host the first North Carolina A&T Undergraduate Research Symposium from 9 am. to 5 p.m. in Fort 410. Details are in the post immediately below. Come join us in supporting our undergraduates! Come for any part of the day or the whole thing — we hope to see you there. On Friday, another first — the DORED Cook Out. Interim Vice Chancellor Celestine Ntuen and the DORED staff are hosting lunch for all faculty and graduate students on the front lawn of the Fort IRC from 11 a.m. to 2 p.m. Hot dogs hamburgers, veggie burgers and drinks are on the menu. Please come by and enjoy an outdoor lunch with the DORED staff. Friday’s forecast: Sunny with a high of 92! See you there! A&T’s first Undergraduate Research Symposium will be held Wednesday September 22. The agenda is posted below as a PDF document. Students will be presenting from 9:45 a.m. to noon and 1:30 p.m. to 4:30 p.m. For those who can’t join us for the entire event, the Division of Research encourages you to drop in for any part that you can attend. In addition to 45 or so student presenters, speakers will include Dr. John W. Hardin, executive director of the N.C. Office of Science & Technology; and Dr. Alan Letton, interim associate vice chancellor for research and dean of graduate studies. Chancellor Harold L. Martin, Sr.; Provost Linda T. Adams; and Dr. Celestine A. Ntuen, interim vice chancellor for research & economic development, also will speak. The symposium broadens the opportunity for A&T undergraduates to engage in scholarly activity in a way that previously has been mostly reserved for graduate students. And it’s a great opportunity for faculty, staff and grad students to support the next generation of Aggie researchers. Please join us on Wednesday! 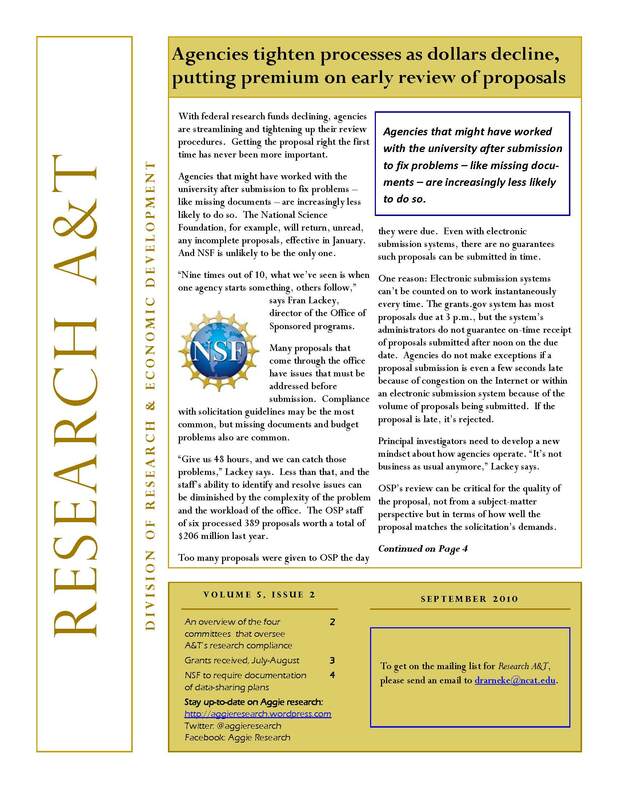 Click to see the N.C. A&T Research Capabilities brochure (PDF).